The Council of Fashion Designers of America host their fashion love-in, the CFDA Awards, every June in New York City. If you’ve not heard of the CFDAs think of them as a toned down Met Ball. Less about global divas working it for maximum Instagram likes, the CFDA Awards are much more about the proper business of honouring the best designers and recognising the up-and-coming names in American and global fashion. All hosted by America’s new favourite Brit, James Corden. Last night the fashion A-list opted to wear elegant, but ultimately unthreatening gowns with a slashed neckline here or split skirt there, but unlike at the Met Ball, there was barely a sheer number in sight. 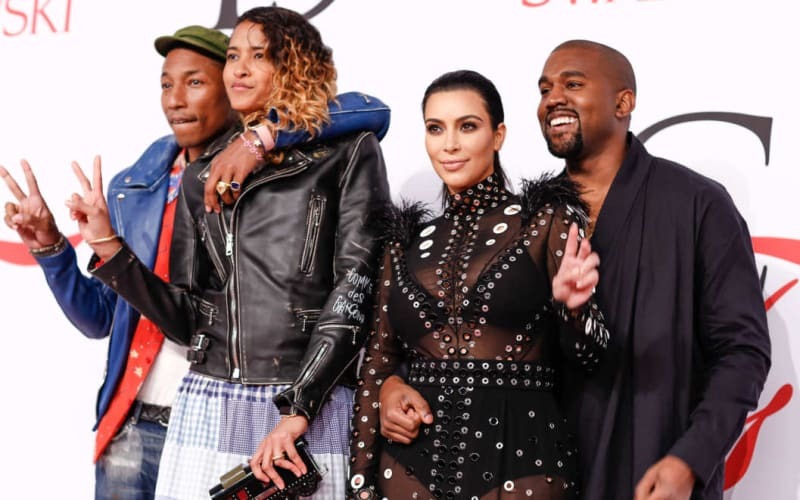 With the expected exception of newly pregnant Kim Kardashian West who wore custom made Proenza Schouler for the occasion with husband Kanye proudly cradling her teeny-weeny baby bump on the red carpet. Highlights of the evening included Kim Kardashian West presenting the Media Award to Instagram, with her handing the special award to its CEO Kevin Systrom only for him to comment “I may be the CEO but Kim you are the Queen of Instagram.” Too true! Coco Rocha took a night off from caring for her two-month-old baby Ioni Conran to walk the red carpet in a dress created for her by the creative director of Banana Republic. Here she is posing with legendary Instagrammer “The Fat Jewish” aka Josh Ostrovsky. Joe Jonas, Thakoon and models Lily Aldridge, Bella Hadid in Mischa Noonoo and Gigi Hadid in Michael Kors pose up a storm at the CFDA Awards 2015. Pharrell Williams receives his CFDA Award from his “brother” Kanye West, and says that being “different is the ultimate asset,” and plays down his status as a style icon saying “I’m not a style icon, I’m just inspired.” We love a humble superstar. 9. The Founder’s Award in Honor of Eleanor Lambert: Millard “Mickey” Drexler, Chief Executive Officer and Chairman of the Board of J.Crew Group, Inc.